Archbishop Arseny was a man whose life was writ large, filled with historic places and historic people. He worked tirelessly for the Church side by side with at least three of the major saints of North America – Tikhon, Raphael, Alexis – as well as with the many martyrs and confessors of Russia during the beginning of the Revolution. In addition to being a key figure in a formative time of North American history, his life of 79 years took in the birth of modernity, the Russian Revolution, the reformation of the Metropolia, the First and then Second World Wars, and so much more. The Archbishop also left an indelible mark on Orthodox life in Canada, where he is fondly, even passionately remembered to this day. In short, Arseny's life was such that we can learn as much or more about our history generally as we can about him specifically. He was capable of being all things to all people. He was a married priest, a widower, a father, a parish priest, a monk, an Igumen, a Dean and Rector, a traveling preacher, a prisoner, a Bishop, a founder of monasteries and pastoral schools and orphanages. He walked in the company of great men and women of the faith in every part of his life, and in every country he lived. He was a learned man, an eloquent man, and a humble man. Indeed, he was most of all humble. His was a life of service, of sacrifice, of love for the Church. A full list of references this summary is based is given in Detailed Timeline of the Life of Archbishop Arseny. 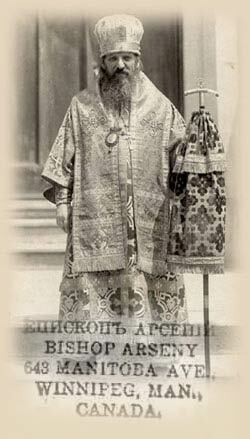 It is no surprise, then, that Canadians have long venerated the holy Archbishop Arseny, even during his lifetime, and that there has been a broad and enthusiastic call for his glorification for some time now. In fact, what is so interesting about this call is that it has not been the call of a few from a specific region, for instance, Winnipeg, where Archbishop Arseny's cathedral was located, but that of many from across the country, and even as far away as New Zealand. Young and old, archpriests and seminarians, converts and prairie-born Orthodox, have united to express their desire for Arseny's glorification. For Canadians and many others, there is no question that he is a saint, a confessor for the faith even, and that his contribution to the Orthodox Church in America (OCA) in general is a tremendous one. The Archdiocesan Archives is dedicated to him, and the Theological Institute formed in Winnipeg bears his name. With the blessing of the Holy Synod of Bishops of the Orthodox Church in America, the Archdiocese of Canada has begun formal work towards the glorification of Archbishop Arseny in the following ways. Following the Holy Synod's direction, the title of "Saint" is now used for Archbishop Arseny instead of "Blessed." As well, an Archdiocesan Canonization Committee has been assembled consisting of, among others, His Grace, Bishop Seraphim of Ottawa and Canada, the Archpriest Dennis Pihach, Chancellor, Archpriest Anatoly Melnyk, Archpriest Andrew Morbey, Priest John Hainsworth, Kyril Holden, and Archivist, Katya Szalasznyj. This committee has been charged with producing a researched Vita of Archbishop Arseny and collecting, translating, and collating as many of his writings as possible for submission to His Beatitude, our Metropolitan Herman, and the Holy Synod, as directed, for October 2004. This document is the fruit of that committee. The research involved in this Vita is broad and includes not only the Archdiocesan and OCA archives, but also those of the countries and regions wherein Arseny worked and lived, particularly those of Kharkov, which were graciously supplied by His Beatitude Nikodim, Metropolitan of Kharkov and Chairman of its Canonization Commission. The latter provided valuable information on Archbishop Arseny's family, particularly his son, the Hieromartyr Dionysius (+1937). As well, some of the letters and reports of the miraculous effects of Arseny's prayers have been collected and are included. The material for a Vespers, including a Troparion and Kontakion, for St. Arseny has also been written and is also included. The proper and modern spelling of the Ukrainian city is Kharkiv, while "Kharkov" is the preferred spelling for the Russian speakers. "Kharkov" is used in this article, as well as in the "Detailed Timeline Vita of Archbishop Arseny" of the current issue in order to maintain consistency and avoid confusion – in most historical documents related to the life of Archbishop Arseny the city is mentioned as "Kharkov." While the widespread veneration of the Holy Archbishop Arseny is most keenly witnessed in Canada (where he worked tirelessly and effectively, founded a monastery and pastoral school, and even suffered as a confessor of the faith when he was shot by radicals and wounded), the Archbishop really stands with the whole college of Saints of North America. We know for certain that he worked and worshipped side by side with St. Tikhon, St. Raphael, and St. Alexis Toth, and his work in founding not only St Tikhon's Monastery but also its Seminary (which he undertook in the retirement forced upon him by his gunshot wound) have had a profound effect upon the history of the Orthodox Church in America and will continue to do so long into the future. What is more, St. Arseny manifestly had the same missionary zeal as St. Herman, St. Innocent, St. Jacob, and the Alaskan Martyrs, Juvenaly and Peter the Aleut; it is also significant that in 1907 Igumen Arseny was entrusted with the bringing of the holy relics of more than fifty saints from the Old World to America, so that he is clearly linked with the building of a strong spiritual foundation in America. The work we have undertaken in the Archdiocese of Canada, on behalf of the Holy Synod of Bishops, really consists in raising up another example of the extraordinary out-pouring of God's grace in this new land. We seek to echo, in fact, Archbishop Arseny's own words, as he watched the procession of hierarchs and priests approach the newly built St. Tikhon's Monastery, "O Mother! O Holy Orthodox Church! Come and see! Behold your children who have come to glorify the Lord Whom you glorified!" Archbishop Arseny was born Andrew Lvovich Chahovstov on March 10, 1866, in the historic Cossack region, known as "The Sloboda" (free settlement) in the village of Ohultsev, Valkovskii U'ezd, and was the eldest son of reader, Lev and Anna Chahovtsov, a family of five children. As a young boy heworked as a shepherd tending "the flocks of mute sheep owned by my father and did not dare to dream of becoming the pastor of a rational flock." Arseny's natural intellectual abilities were noticed early, and his family had decided, "in view of my alertness and love for school," to send him to "the city, in the commercial branch, in order that I could stand on my own feet more quickly to help them with their large family." However, at an unknown age, his father died leaving him one of "five little orphans," and as he was the eldest he was sent immediately to a school for clergy children where "eleven years of happy school life flew by." He was then admitted to the Kharkov Theological Seminary, graduating with some distinction in 1887 and being ordained Deacon and then Priest in the same year. From the second class of Seminary onward, he was a tutor to three children attending the gymnasium belonging to the noble family of Pavel Silanskiy; for which he received three rubles a month which he sent to his mother to assist in raising his smaller siblings at home. Of course, this raises more questions than answers. What did he mean by "in the coffin nailed before its time" or "entangled in iron chains?" And what was his meeting with Father Kronstadt like, and what did the great Saint say to him? The remarkable quality of this speech shines through in the drama and feeling of its presentation, but it is made more remarkable by the fact that it was spoken to a group of Bishops, clergy and laity at his Elevation to the Bishopric in Winnipeg. Certainly it is a remarkable Bishop who would relate such a story of his past in such a public arena and at such an occasion. Parting with the baptismal name of Andrew, he took the monastic name of Arseny, in honour of the holy Arseny of Konev (June 12) and was numbered among the brethren of the Kuriazhskiy Holy Transfiguration Monastery, the Kharkov "Guberniya" (region). But having been led to his monastic refuge, Arseny was soon made Igumen (Abbot) of the Kuriazhskiy Monastery. On December 5 1900, His Grace Bishop Innokenti (Sumskiy), the Vicar of the Kharkov Eparchy, petitioned the Archbishop for a blessing to take the Hieromonk Arseny, "as a man pure and hardworking, as a monk by inclination and as well by calling, to serve at the Kuriazhskiy Monastery and there to be in charge of all services." This request received the blessing of His Eminence, Archbishop Amvrosy that very day! "Exactly two years ago, to the very day, I was led by God's Providence into this holy habitation and this brotherhood, and took the name of its holy superior, under His Grace, the Rector. Now I go to the New World, with a cross and a Gospel and begin the word of my calling; where reason will prove useless, where a word will become ineffective, there I will open my heart and fulfill all with love. But I know that this road is not going to be easy — it is ornamented strewn the flowers of sorrow and renunciation. Ready to embrace this, I depart from you, and this one thing do I ask of you: do not forget me in your prayers, cover my weaknesses with your brotherly love and with your prayers lighten the burden of my apostolic service." And again, many years later, reflecting upon that day, Arseny would say, "I accepted from the hand of God the fate of a preacher. The right hand of God transported me to the side of the New World – America." What is interesting is that he saw himself as accepting the "fate of a preacher," a description which gives us an insight into how Arseny saw his role as a missionary in America, which was as a preacher, a sower of the Gospel. 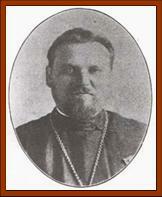 Hieromonk Arseny reached America in January 1903. By the resolution of Bishop Tikhon, Arseny was assigned to be rector of the Orthodox parish at West Troy, New York. In 1904, he was assigned to be rector at Mayfield, Pennsylvania. He was the second rector of that parish which had been reunited to the Orthodox faith from the Uniates. Under his leadership, the parish so flourished that the congregation even began to assist other Orthodox churches. Curiously, his work with the returning Ukrainian Catholics is not mentioned in any of the memorial articles and accounts of his life. Only he mentions this vital aspect of his early ministry, and in very passionate terms: "The Stamp of my apostolate is the believers in Troy, Mayfield, Simpson, and the brethren scattered in many places – which I brought back into the folds of the Orthodox Church." The Ukrainian Catholic return to Orthodoxy, as lead by St. Alexis Toth at the turn of the century, was a very contemporary issue when Arseny arrived, and Father Arseny would have certainly worked closely with St. Alexis Toth. In fact, in 1902, St. Toth himself received "the parish of St. John the Baptist in Mayfield, Pennsylvania" and thus must have passed its care directly to Arseny. It is clear therefore that Arseny's role in the return of this Church was significant, although history has so far remained silent about the extent of this role. However, working side by side with St. Alexis Toth, Father Arseny nevertheless had another dream for the Church in North America, and it was one which he was to realize just three years after his arrival on the continent and one which was to win him a lasting name in the New World. Seeing the burning desire for the faith and the desire to strengthen Orthodoxy in the New World, Hieromonk Arseny put forth the idea of building the first monastery on the North American continent. His proposal was crowned with success and among those in the parish he found ready volunteers to donate land for the monastery and a bell-tower. It soon became evident that the place available in Pennsylvania was suitable for a monastery, and the parishioners made the first down-payment. The project was put before the Mission administration of Archbishop Tikhon. Vladyka then realized that Hieromonk Arseny's inner direction was always towards the establishment of a monastery, which he considered essential to a true understanding of Orthodoxy, as a fostering ground, a centre and an image of Orthodox spirituality in America. With the blessing of Archbishop Tikhon, in May 1906, Arseny founded St. Tikhon's Monastery and Orphan's Home in rural northeastern Pennsylvania. The story of his labours and feats of fund-raising are well documented in the literature of the day. Indeed, on the day of the monastery's consecration, Bishop Raphael claimed that it was impossible "to pass by in silence those exemplary labours, struggles, works and endeavours, which were applied in an untiring way, always hoping in the blessing of God, of the respected Mayfield Rector, Fr. Igumen Arseny, for the realization of this glorious act – the founding of this Holy Monastery." Father Arseny was named Superior of the new monastery with the rank of Igumen, an honour for which Father Alexander Hotovitsky, an eyewitness, claimed was met with cries of "Meetly Worthy!" It is indeed a remarkable moment in history to contemplate: Archbishop Tikhon, Bishop Raphael, and Father Alexis Toth processing together to the new monastery built by Father Arseny and concelebrating there. One eyewitness claimed, "Even though I had seen in Russia festive multitudes headed by Hierarchs, with thousands of vestments, the procession here was more impressive. This moment cannot be repeated! This feeling cannot be expressed! I could not expect anything more from this procession!" Even Father Arseny's voice, claims the same witness, "was stopping, because of choking with tears." Arseny in fact was elated "that all this took place here, in a foreign land, where yet we are so little known," exclaiming, "O Mother! O Holy Orthodox Church! Come and see! Behold your children who have come to glorify the Lord Whom you glorified!" Such it seems was Arseny's vision, the firm establishment of the Orthodox Church in North America, and it is one which he states many times in his description of the founding of the monastery to be the source of his great joy at the event. However, in February 1907, Igumen Arseny petitioned Archbishop Tikhon for his blessing to return to Russia for a three-month period, until April 25. It was not a request intended for a rest; rather it was submitted for three reasons: "to fulfill the debt of a son—to visit my aging mother; to select from the monastic ranks two or three worthy monks and to bring them back with me for our community," and in Russia to appeal to noble and generous donors. Igumen Arseny asked His Eminence to give him in his name a Contributions Book for the collection of money in Russia. Vladyka blessed his request, and thus we see Igumen Arseny in St. Petersburg at the Holy Synod, where he requested a donation for the monastery and received the sum of 500 rubles, and also "permission is granted for Igumen Arseny to carry out the fruitful activity by raising funds through donation throughout Russia, by the blessing of the Eparchial hierarchs." Most significantly, however, Arseny returned to St Tikhon's monastery with "fifty holy relics received from the Moscow Synodal Office for the North American Eparchy." Yet, in his speech of 1926 at his elevation to the rank of Bishop, Arseny says nothing of the founding of the monastery, but passes on, for reasons unknown, from his duties as Pastor of Mayfield to his reassignment as Rector of Holy Trinity Cathedral in Winnipeg and rural Dean and Administrator of the Canadian parishes. He was assigned to Canada in 1908 by Archbishop Platon who had just replaced Tikhon, and soon after arrival Arseny applied his enormous energies to the building up of the Church there. From almost the moment he arrived in Canada, the Canadians loved him. One commentator notes, "By God's Providence, to us was sent a tireless protector for this country. He was an excellent organizer and a wonderful preacher and all of this led to the progress of parishes in all of Canada. His incomparable, majestic sermons acted upon their listeners and very soon churches were full of faithful, sincere parishioners, particularly immigrants from Bukovina." He was fluent in Ukrainian, and also in many of the Russian dialects and so was able to preach in the native dialect of many parishes across the country. "It was in Canada," says The Tikhonaire (annual magazine of Saint Tikhon's Seminary), "that his rare missionary talents increased and bore fruit." Again his efforts were concentrated on receiving the Ukrainian Catholics back into the Church, as well as welcoming the many Bukovinians and Galicians immigrating en masse at that time. Arseny's efforts in Canada were tireless, as he himself describes: "Through the depths of virgin forests, through the limitless prairies of wide Canada, I started searching for those who had gone astray, strengthening the faith of the weak, and instructing the growing generation with the light of the true teaching." His greatest tool was his preaching. It was in Canada that he gained the affectionate title, "the Canadian Chrysostom" for his extraordinary preaching talents. "In January of this year, I completed seven years of service in the American Orthodox Mission. I worked, by the mercy of God, as I could, attempting not to be lazy, to carry on the high calling of a missionary, to make a steady effort, not operating solely from rationality/intellect. In the last two years of my service, heavy afflictions and laborious work in the Canadian wilds had taken their toll on my health, and material lack have repeatedly brought my spirit to full despondency. In the last while I have been fully invalided with a terrible hernia, which from the constant journeying creates horrible pain; doctors are trying to force me toward a surgery, but I am afraid to lie beneath a knife, lest I die in this foreign land. In the Mission is full of abject misery and debt. But the All-Seeing God is my witness, Merciful Vladyka, that I came to this place, not because of luxury or because of immoderation in my life but totally because of my desire to further the cause of our Mission in Canada. Feeling myself unfit physically and weak in spirit to continue this work in the Mission…I ask you to release me from the responsibilities of the Canadian Diocese and the work of the Mission. If a decree to this effect from Your Eminence is forthcoming, I will, according to the measure of my strength, carry on my duties until I receive the funds from the Holy Synod to make the trip, as I have no personal monies for this, whatever." No one could guess, however, that Arseny would return some sixteen years later, after serving as a preacher and pastor in the very trenches of the Bolshevik Revolution, and returning he would accomplish much more, though it would be nearly at the cost of his life. When Arseny left Canada for Russia in 1910, he could not have imagined what his life would be like. From his own account, he returned "with the title of missionary-preacher, then, as the director of a school for missionary-priests." At the beginning of 1911, he was assigned to be the assistant of the Eparchial Missionary, Protopresbyter Timofei Butkevich. Then, in 1913, an Act of the Holy Synod established Archimandrite Arseny to be the head of the Gregory-Biziukov Monastery (a first-class monastery) Kherson-Odessa Eparchy, and on August 25 1913, the head of the Pastoral Missionary Seminary at the monastery, where he remained until 1917. The Tikhonaire (annual magazine of Saint Tikhon's Seminary) writes that "while he was there, the revolution broke out and seeing the terrible sufferings and terrors being inflicted on the Church of Christ and His Faithful, Archimandrite Arseny joined the White Armies." An account of his service in the White Army is given by Arseny himself in his usual descriptive style: "as a missionary preacher, under the whistling of the bombs, the explosion of shrapnel, I comforted the soldiers, and wished to give my life for my brothers." "At the Infirmary of the Gregory-Biziukov Monastery – twenty sisters from the women's monastery are caring for the sick and the wounded. The infirmary has acquired both hospital clothing and linens (for 100 beds, 4 changes), 115 warm dressing-gowns, etc. When the head of the Gregory-Biziukov Monastery, Archimandrite Arseny, was sent to serve the Army in chaplaincy, the sisters of the Holy Annunciation community brought linens and other items necessary for the soldiers bought with their personal funds which included 120 bags filled with presents, which were distributed by Father Arseny personally at the front. The Commanders warmly thanked the monastics for their gifts." By 1918, Archimandrite Arseny held the position of the Protopresbyter-Chaplain of the Army of All Ukraine and was put forth as a candidate for consecration to the Episcopate. He was Chairman of the Commission for the Acquisition of Material Means for the White Army. At one point, Arseny was captured by the Bolsheviks "and sentenced to be shot, along with several others, on the following morning." According to accounts, Arseny spent the night praying and preparing for sure death, but in the morning, "shortly before he was to be shot, a detachment of German soldiers appeared and rescued the condemned men." After this miraculous escape, Arseny fled to Serbia, where he served as the parish priest of a Serbian Church in Milianovtsi and head of Sreza Porechok. From 1924 to May 1926, he became the head of the Monastery of the Holy Archangel in Markoviy Hrad and was at the same time teacher of canon law at the Serbian gymnasium in the city of Prilep, south Serbia, where he thought "that the book of my life was written up and ready to be closed." The Canadians, however, would add more pages. Having received news that Father Arseny was still alive, they petitioned Metropolitan Platon with some insistence that he be returned to them as Bishop. Platon complied, and in 1926, letters were sent to Belgrade to arrange his consecration. The Holy Synod directed: "For Archimandrite Arseny, Bishop of Winnipeg, Vicar of the North American Eparchy. In order to consecrate Archimandrite Arseny, it was necessary to call a Hierarchical Sobor and it was imperative to send him, Fr. Arseny, as soon as possible to America, which was completed in Belgrade, with preliminary agreement and the blessing of His Holiness, the Patriarch of Serbia." On May 24 1926, by the direction of His Beatitude Metropolitan Platon and with the blessing of His Holiness, Patriarch of Serbia, Dimitri, he was consecrated to the Episcopate (Winnipeg) in Belgrade (Serbia) in the Russian Orthodox Church by His Beatitude Antoniy, Metropolitan of Kiev, and the Galician Chairman of the Synod of Bishops of the Russian Orthodox Church Abroad, His Grace, Hermogen, Bishop of Ekaterinoslav and Novo-Moscow, and His Grace, Gavril, of Cheliabinsk and Troitske. Bishop Arseny's response to this was typical of him: "I am coming. My heart is ready. O my God! Ready!" (Psalm 107). Arseny travelled to New York for a meeting with the Metropolitan. Afterward, he spent a short time visiting his beloved St. Tikhon's Monastery, and then arrived in Winnipeg to take up residence in his new diocesan see. The arriving bishop told his flock, "The love of the Archpastor of the Orthodox Church in America and Canada, His Beatitude, Metropolitan Platon by the Higher Authorities of our Church Abroad, the Holy Synod, called me to Hierarchical service in the Canadian fields of harvest." He then presented to the gathering a Relic of the Holy Life-Giving Cross of Our Lord, which he had brought from Europe, and told them: "In this Cross is a portion of the Life-Giving Cross, on which was crucified Our Lord, Jesus Christ. This Holy Relic is a gift of Bishop Arseny to Holy Trinity Sobor, City of Winnipeg." However, by all accounts, Bishop Arseny had come back to a very different Orthodoxy Canada than what he had left 16 years earlier. The so called "Living Church" had risen since the Revolution and was causing great trouble, as were various Ukrainian nationalist groups. According to Archimandrite Antony (Tereshchenko) "a whole book could be written, outlining in it all that Vladyka Arseny suffered in Canada after his return, but it would be a catalogue of horrors. His Eminence had to wage war against the 'ill weeds' on several fronts, and it was difficult at times to distinguish who was one of ours, and who was on the other side." Still Arseny pressed on, traversing the vast country, preaching, founding monasteries in Sifton, Manitoba, and Bluffton, Alberta, and throughout Alberta. He even travelled as far as Vancouver, British Columbia, where he concelebrated with Metropolitan Platon in the consecration of a new Holy Resurrection Church there on August 9 1929. He was very active in directing the church, frequently convening clergy assemblies and "Sobors" (clergy and lay persons assemblies), and although he was a strong leader and a passionate defender of Orthodoxy, he was known to be unusually ecumenical both in his relationship with other sometimes non-canonical Orthodox churches, but also with other Christian confessions. In 1928, Vladyka Arseny wrote a general missive for the strengthening of discipline and reverential ways in the parishes. Many questions were considered and recommendations made, and in his words we glimpse the true Orthodox Canadian mentality of this shepherd. He writes to his flock: Never, by any means allow into the life of the Church any politics and with all our strength root out all nationalist chauvinism. The shepherd must be dear to every member of the flock, whether he is big, small, dark, white, or from Carpatho-Rus', Bukovina, Romania, Serbia, Bulgaria, Greece and so on. First of all: ORTHODOXY. And this does not mean that we do not need to keep our national languages. It is essential that every church should build a parish school in order to teach the children their mother tongue and its grammar, and it is very important that Catechism be taught, at least on Sundays. In conclusion, I beg of you and pray: in church and before services, we need more reverence; beyond the church and in home life we need more decorum and in everything – more inclination toward the things of God. Bishop Arseny took upon himself an unusual task: he asked Metropolitan Platon's blessing to collect funds throughout America for the northwestern parishes of Canada. He explained that, "for 220-300 miles there is not a single church or a chapel, no cemetery; children are left without baptism, are not buried with a funeral service. Missionaries from other faiths, particularly French, build churches where there are none of their faithful and then they call ours to come. Do not say that asking spiritual bread for our own, according to faith and blood, we can judge, close our eyes and ears and say in a monotone: We are poor?... I as Bishop of the Church, seeing the dire straits, fear the Lord and His Great Judgment, with His hand; I pity the souls of the Orthodox given over to other faiths… And never did I know in all my sixty-four years that to take upon myself this task, it is better to burn one's soul in the fire of service, then to have it smoulder in a slow flame". "Right now I am interested in hearing/collecting/gathering the thoughts of my priests on the establishment of a school/bursa for the 'birth' of priests, candidates to the priesthood from Canadian youth. This question is totally important and sharp. The diaks' (cantors/readers) theological knowledge upon being tested, is found inadequate. Brothers from Russia – there aren't any, and it is expensive. We must think of those here, instead. We cannot look to the general American theological schools as Canada is considered 'Siberia' from which people try to run away as fast as possible. We are left with our native Canadians, candidates from which we must locate and raise up, one by one as theological cadres. It is hard, both materially and for the morale, especially in the matter of teachers. But all this I dare and prepare the way with an iron a desired purpose." "I threw myself into my endless flying around from place to place in wide Canada not able to fulfill my schedule and often lamenting that there were only 24 hours in a day. I just sat down on the train and am traveling from Saskatoon to Winnipeg, so that in two days I can go from there to Moose Jaw. The train goes through snowbanks. The train cars shake terribly and one cannot write… At Sifton I managed to stay in that spiritual bliss for only a single week. How good it was there and pleasant! But my work does not allow me to stay there long. Everywhere is agitation and trouble. If I am delayed, then much will befall. Above my grave write that the cause of his death was not the office but he was 'zealed to death' with flying from place to place for the good and peace of the Church. If in the New Year they cut my wings for flying, I don't know what will happen to me…now I am in Montreal, beginning my flappings over all the visa trouble." "Everywhere in America and Canada they are organizing some kind of new Orthodox churches with Zhuk [the name of a schismatic, ed. ], and we, the Orthodox, pray and observe that our sheep are turning to foreign folds. Why do we not come to agreement with other Orthodox bishops, that is, with Greeks, Serbians, Bulgarians, Syro-Arabs and discuss at our Sobors about the ways and means to preserve true, historic Orthodoxy. I am afraid to die, to leave the Church in such chaos. It is obvious we are bliustiteli : we are guardians of the Church." "Today you pray with us for the last time. You are entering into your rest. At this moment, the parish of the Church of The Great-Martyr Barbara, which thirty years ago you consecrated, and in which You served as First Rector, wishes to express to You its deepest gratitude for your work in the formation, development and strengthening of the Orthodox Church in Edmonton, Alberta and in all Canada." According to a Church Directory of 1936, he was re-assigned briefly to Detroit and Cleveland retiring to St. Tikhon's Monastery after only ten years of service in Canada, leaving a legacy which remains in the Canadian Diocese to this day. The Archbishop remained a Canadian citizen until he died. Bishop Arseny was elevated to the rank of Archbishop for his tireless work, and he was expected to retire quietly from church life. However, he soon after astonished just about everybody by applying to the Holy Synod for the blessing to establish St. Tikhon's Pastoral School (later Seminary), which he did in record time in the Fall of 1938. The opening of the School was another feat of tireless labour and ingenuity on Archbishop Arseny's part, and the speed and apparent certainty with which he accomplished it were nearly miraculous. Typically, he was loved by the students who, according to The Tikhonaire (annual magazine of Saint Tikhon's Seminary), "each year on his birthday and name's day, would honor him with bouquets of flowers." It is interesting also to note the importance Archbishop Arseny gave to the use of English in Divine Services. Although he laboured to establish good Russian schools for the young, and even held supplementary classes, 3 and 4 times a week, for perfection of the language. However, he felt strongly that the English language was for future use. In the years following his retirement, Arseny was never idle. We hear of him visiting local parishes, blessing altars, such as that of St. Nicholas Church in Olyphant, Pennsylvania, on December 19 1940, or traveling to assemblies and special occasions. However, even as he returned to the life of a simple monk, he never stopped in his service to the Church, so that we find him bookkeeping, gardening, returning to the simple joys, and often instructing the young seminarians on how to preach. On October 4 1945, at the age of 79, Archbishop Arseny died in Moses Taylor Hospital in Scranton, Pennsylvania. The funeral and interment took place on October 9, at St. Tikhon's Monastery attended by His Eminence Archbishop Vitaliy, Their Graces, Bishop Alexiy, Bishop Makariy, and Bishop Leontiy, and more than fifty priests, Hieromonks and Deacons, as well as students and friends. So much remains to be said about this remarkable man. It is obvious that his contribution to the Orthodox Church in America and Canada was memorable and foundational. He shared as passionately the same missionary vision as the great saints and Fathers of Orthodoxy with whom he worked. He was capable of being all things to all people. He was a married priest, a widower, a father, a parish priest, a monk, an Igumen, a Dean and Rector, a traveling preacher, a prisoner, a Bishop, a founder of monasteries and pastoral schools and orphanages. He walked in the company of great men and women of the faith in every part of his life, and in every country he lived. He was a learned man, an eloquent man, and a humble man. Indeed, he was most of all humble. If he has remained in the background, if his extraordinary life and contribution to the Church have gone unsung it is because his accomplishments were never for their own sake, but for the Church, in which he knew he was only a servant. His was not a zeal for self-advancement, it was a genuine zeal for the Kingdom of God, for the Gospel, and it is significant that he is best remembered as a master homilist, as a Canadian Chrysostom. His was a life of service, of sacrifice, of love for the Church. In a word, his was a life lived in response: response to the call of priesthood, response to the call of the North American mission, response to the call of God wherever it would lead. And we hear his response, even on the eve of his return as Bishop to Canada, "I am coming. My heart is ready. O my God! Ready!"